I wonder what Karn dug up then. I think the Jaya/Luti reveal and the interaction with Chandra were handled quite well in this story, at least on Jaya's part. Ironically, pretty much everything about it works even better if you're like me and try very hard to hold on to the original pre-Origins continuity. 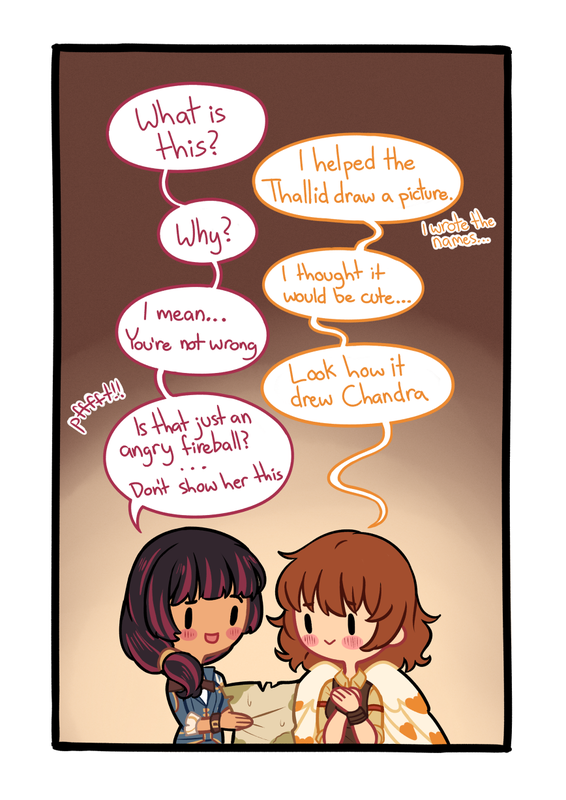 For starters, there's the idea of Jaya hiding her true identity rather than coming back and being worshipped and looked up to for being a planeswalker, an idea that was also peresent in TPF where Luti wants Chandra to not tell anyone she's a 'walker (which was done away with in Origins). Her reasons for that were pretty much the same reasons we hear now, she wanted people to look for guidance in themselves rather than in iconic planeswalker figures. In addition to that, there's this little tidbit: "I'd been aging for sixty years, and I wanted to do something worthwhile for what was left of my life." Sixty years. 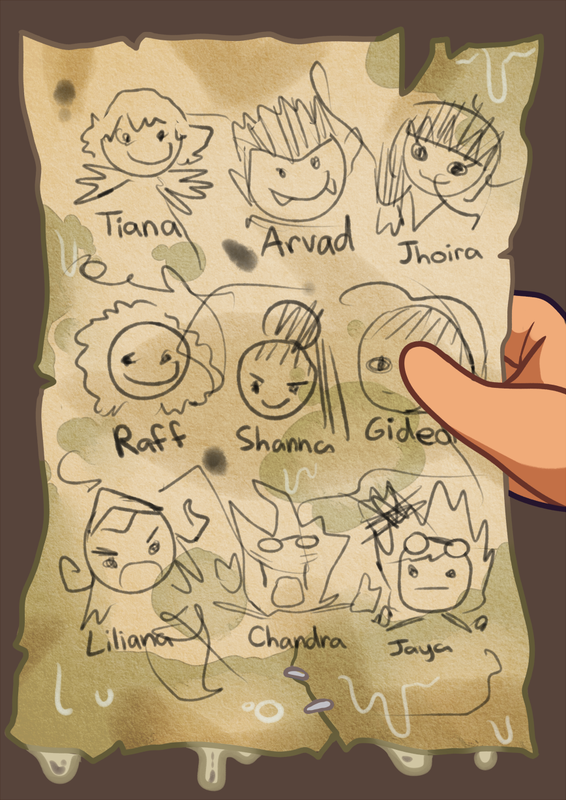 I LOVE how this favours the original TPF-timeline of Chandra having arrived at Keral Keep only some time ago, rather than having joined them as a child. Granted, there might be a reference in TPF that's contradicted here (if Luti has been there for much longer than Chandra), but for now I'll just be happy about it and give it a pass (it's not like I have the time to go through TPF to check anyway). I also love how Jaya calls Chandra out on her BS several times ("Or was that some other time you yelled in my face and disappeared? It happens so often, all the occasions blend together!" "When I was Mother Luti, you dismissed me as a useless old woman. As Jaya Ballard, suddenly I'm worth listening to." Also, this sentence pretty much sums up everything I wanted out of a hypothetical Jaya-Chandra interation: After that there was a lot of Chandra shouting and Jaya mostly ignoring her. I must say, I'm disappointed by Karn's absolute lack of "world-shaking power". I love the motif in Martha's stories of the Gatewatch being totally clueless about everything and just standing there while the adults in the room are talking (Multani looked up at the Weatherlight then, and frowned. "You used Molimo's seed?" "Who's Molimo?" Chandra whispered.). The scene where we catch up with Jace arriving on the Weatherlight doesn't even come close to matching the scene we got at the end of RIX. Like, wow, that's some lazy editing right there. Also, aether trails simply aren't a thing within a plane, they are the trace a 'walker leaves while 'walking the Blind Eternities. Jace tracking down Gideon that way is the same category of BS we got last week with Chandra suddenly sensing Jaya. At least the Jace Face leaves again and doesn't get dragged into the remainder of the Dominaria storyline. @Cylix: Relax guys, there's no way this is intended to be the Golgothian Sylex. For starters, it's spelled differently. I think they're just randomly making up stuff that Urza supposedly worked on as a vague backup plan (like that dungeon he supposedly built in the Tivan Desert). It's annoying, but for now I'll assume it's a different animal from the Sylex. As you say, the description doesn't match, the original one was destroyed, and there would be no reason for it to be buried in Yavimaya, especially now that the podcast confirmed it isn't in the same location as Argoth. Edit: I do wonder how Chandra knows about New Phyrexia, though. Maybe she's friends with Koth and he stopped by to try and recruit her, but his explanation made it seem like a hopeless situation she couldn't actually help with? Or maybe there was a point where Ajani got to tell the gatewatch off-screen during their time on Kaladesh? Or maybe there was a point where Ajani got to tell the gatewatch off-screen during their time on Kaladesh? Also, I think he explained things with what happened to Elspeth, so it had a strong possibility coming up then. So someone pointed out on Tumblr that Jace showing up now in the story fundamentally does not work with how long he was on Ixalan. Following the timestamps in Return to Dominaria there's around a dozen days of time whereas Jace definitely took a month or two to get to Orazca and meet Azor. Also, aether trails simply aren't a thing within a plane, they are the trace a 'walker leaves while 'walking the Blind Eternities. Where has something said that aether trails aren't a thing within a plane? Phyrexia is known on Dominaria and New Phyrexia's return has been circulating for a while among planeswalkers, so its not hard to see how Chandra got up to speed. Was there ever confirmation that time flows the same on all planes? It might be a bit slower or faster on some planes, or even shift in relative rates to each other, potentially based on conditions in the plane or in the part of the blind eternities it is found in, which could explain some issues like that away without actual time travel being involved so long as things don't actually happen out of order? Was there ever confirmation that time flows the same on all planes? Brady Dommermuth nipped that in the bud years ago. I thought it got unnipped in the bud, and time definitely does flow the same on at least the ones we've seen. The only instance of time not flowing the same on all planes since origins is Sarkhans Wild Ride. I guess Ajani it is then. 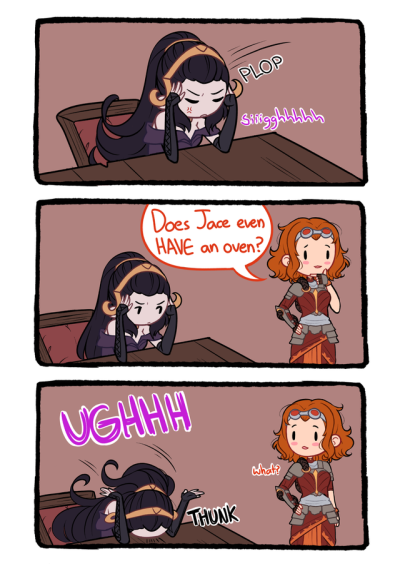 Would have been nice to see that play out in a story and to get everybody's reactions (especially Liliana's because of Dominaria's history with Phyrexia), but whatever. Why would they be? There (usually) is no aether within the planar boundaries of a world, so what medium would there be for a 'walker to leave a trail in? You can't leave footprints in the snow if there's no snow. Planeswalkers just can't detect the presence of other 'walkers on a plane anymore post-Mending. This was also confirmed by Brady. As to the flow of time on different planes, Brady said that, while it might not be impossible in-world, they aren't going to bring it up and just work under the assumption that time basically passes at the same rate everywhere. Tracking timelines across different planes would turn into a complete nightmare if they established that time passes at a different rate on different planes. It would end up creating more problems than it would solve in the long run. Maybe they track some aether into the plane when they arrive. Like they were leaving footprints in the snow outside, but now they are leaving wet footprints on the carpet because they didn't wipe their feet when they walked in. 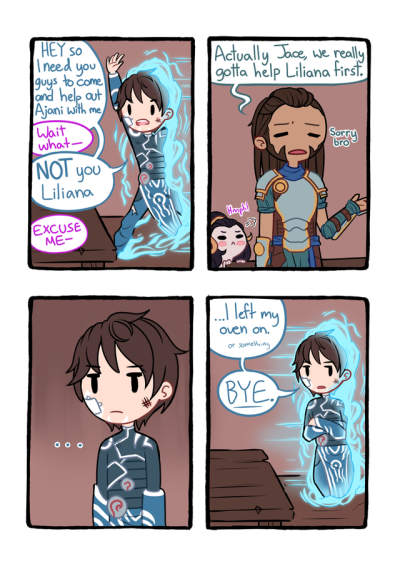 Well, but Gideon had been on Dominaria for ages when Jace somehow tracked him and planeswalked there. And it also wouldn't explain why Chandra claims to have sensed Jaya's aether trail the moment Nissa left (and while she herself was still on Dominaria). I just don't see the connection between those two events. And why didn't Chandra notice Jaya's trail leading back to Regatha (let's not get into the extremely weird timing of Jaya suddenly being back at Keral Keep when Chandra gets there...)? Shouldn't that have been a lot easier to spot anyway? This whole new way of planeswalkers tracking each other simply clashes with a ton of earlier post-Mending stories where it would have been relevant but didn't come up. I feel the need to be slightly creative-writing soapboxy. I get that WotC is trying to cram too much into to small of a space storywise. There are actually greater examples of lost opportunity earlier, particularly with the Josu stuff. The issue I'm about to state is a relatively minor nick pick, but it actually has a lot of structure lessons in it. There's a reason why the traditional play structure is the three act play. There's also a case to say the five act play is so, but the five act play's primary plot happens in the middle three, with the first act telling exposition and the fifth the ramifications of the middle three. Setup, confrontation, resolution. This idea of three really does give a psychological feeling something is established. If something occurs three times in a story, it isn't thought of as a coincidence anymore. True, truer, truest. Chandra's poor behavior toward Jaya is given three separate events in the story structure. The first is in the backstory as Chandra mentioned being a bad abbot who wasn't taking her lessons to heart. The second is when she stole Jaya's goggles. The third is when Chandra expected Jaya to automatically want to teach her when Chandra realized Luti was Jaya. To counteract her previous behavior, Chandra really ought have shown three separate instances of change in front of Jaya. (Requiring more just establishes a dynamic of Jaya not thinking Chandra has changed). Any less, and it doesn't feel like quite enough. The first event to surprise Jaya about Chandra's change. The second to make Jaya seriously consider Chandra's changed. The third to confirm it to Jaya. The points but make a line, but three affirms it. The problem is that Chandra really only shows at best two instances to Jaya. First, she decides to help Karn. Second, she helps Multani. She really needs a third to help shake the feeling that this is just a temporary happenstance. As I've said before, considering how much WotC wants to do in the space they've given to the story, it's actually quite well done. But it has real costs. I mean, I understand why this happened. It's because Dominaria they changed over to the three-and-one model and Unnamed Dominaria Small Set became Core Set 2019. Regardless of how much they had plotted out, losing at least 3 and possible as many as 8 chapters definitely blew a gaping hole in their story structure. For the continuity error, Ixalan was probably too far along to compress the time scale and so we have timelines that don't and won't ever match up. As for the rest, I do love the story so far but you're right that it feels rushed and breathless. Probably this is not something that could be fixed, but I hope we get to stories soon that were actually plotted out over the space of one set. It didn't come up because they hadn't thought of it yet. Now they have, its a good solution to the problem of unacquainted planeswalkers finding each other other than by accident and coincidence, and it ties in very neatly with how Project Lightning Bug might work, so I'm glad they've introduced it. Comic is hilarious (and adorable)! I'm literally giggling aloud! 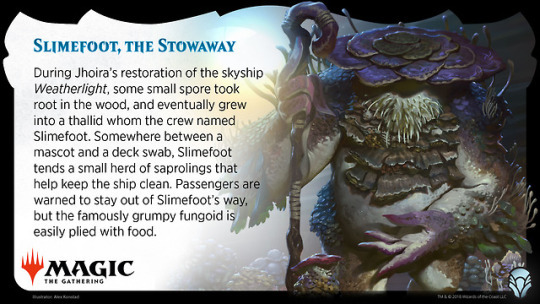 So today's story was sorta cute, though I'm not sure that the Slimefoot we saw feels like the Slimefoot we were introduced to. I did not get the grumpy mushroom janitor I was promised! Its before they gets jaded from their child-like innocence. EDIT: Yes, I changed the pronouns. "It" is henceforth reserved for Ashiok (who defines itself as an inhuman horror) and to characters I don't like (i.e. Nissa).